Disclosure: This is a sponsored post, but as always my opinions are 100% my own. 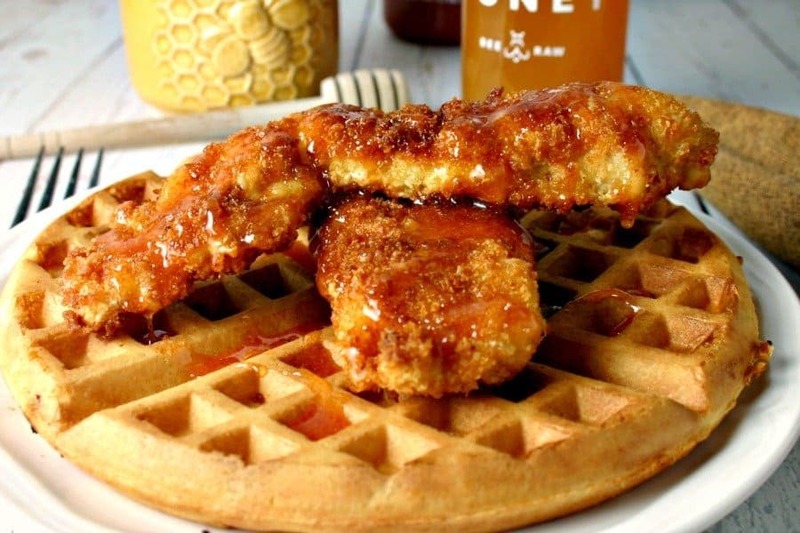 Hot Honey Chicken and Waffles. Light and crispy waffles topped with tasty fried chicken and drizzled with a spicy warm honey. Have mercy! Our National Breakfast Month project is winding up this week with my favorite theme — Breakfast for Supper! I love making homemade waffles for any meal and have found that the “light and crispy waffle” recipe that’s printed in the Oster waffle iron booklet is really versatile. 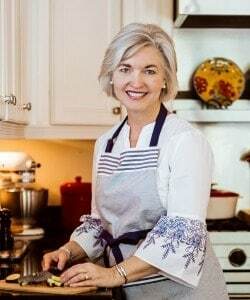 I sometimes toss in pecans or berries and serve them with a side of bacon and maple syrup for supper. 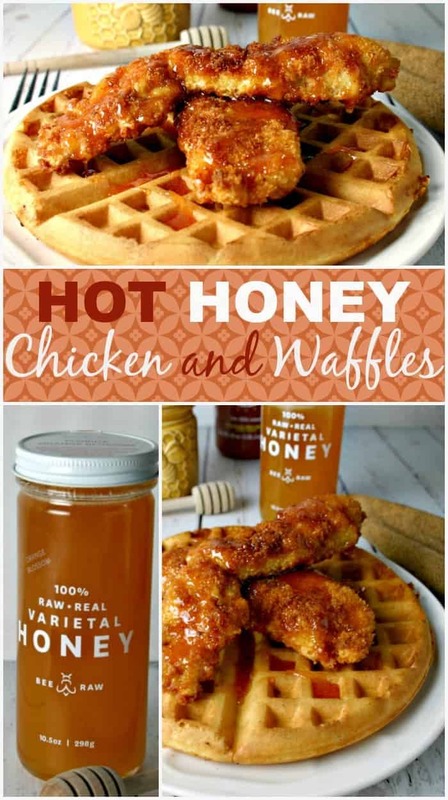 But today, I’m sharing a really special breakfast-for-supper-waffle with you, Hot Honey Chicken and Waffles. My tried and true light and crispy waffles are topped with a couple of pieces of tasty fried chicken and drizzled with a spicy warm honey. Have mercy! You’ll want to do a little multi-tasking to put this dish together. Here’s what I did. 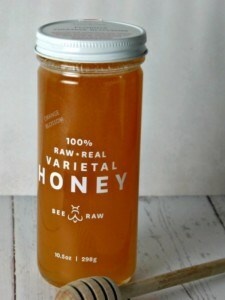 First, I made the Hot Honey sauce with Bee Raw Florida Orange Blossom Honey (yum!) and added garlic and onion powder, a little salt, and Sriracha chile paste. Then, I kept it warm over low heat while preparing the waffle batter. This waffle batter is pretty forgiving and can be mixed up ahead of time and kept in the fridge until you’re ready to cook, which is what I recommend. Just give it a gentle stir when you’re ready to start the waffle cooking. The big job is frying the chicken, so I like to get that done and put the chicken in a warm oven while I cook the waffles. That way, as soon as the waffles come off the hot irons, you’re ready to top them with the warm chicken and yummy hot honey sauce. Combine flour, onion powder and garlic powder in a shallow dish. In a second shallow dish, whisk together the eggs and water. Place Panko bread crumbs in a third shallow dish. Dredge each piece of chicken in the flour mixture, shaking off the excess. Next, dip the chicken into the egg mixture, and then roll in the Panko crumbs. Set aside. Combine all ingredients in a small saucepan over medium heat. Bring to a boil and immediately reduce heat to low. Keep warm until ready to serve. Preheat waffle maker, first coating irons with baking spray. Combine all other ingredients in a large bowl and mix at low speed until moistened. Increase speed to medium and mix until smooth. Gently fold in egg whites. Cook batter on hot irons, using about 1/2 cup per waffle (or the recommended amount for your waffle iron) until golden, approximately 3-4 minutes. 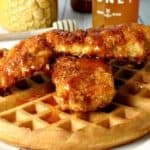 Serve waffles topped with 2-3 fried chicken tenders and drizzled with hot honey sauce. The following companies generously sponsored various #hotforbreakfast month projects. 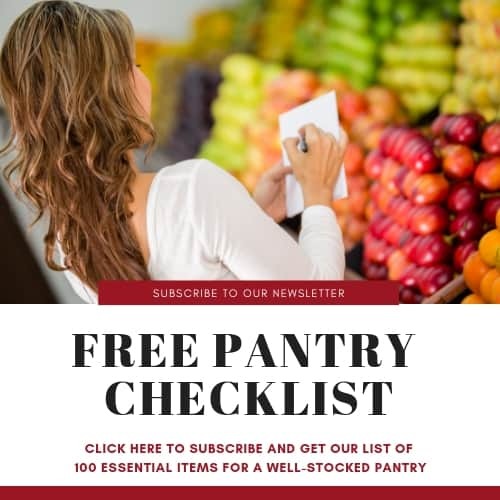 I may not have used all of them in my recipes, but this project is in no small part thanks to them and their incredible contributions: Bee Raw, Bob’s Red Mill, Made in Nature, Maple Valley Syrup Cooperative, Now Foods, Pacific Foods, & Woodstock. I made this today and it was absolutely amazing! I did do some modifications to it. I didn’t have the chili paste so I used some Louisiana Hot Sauce instead and didn’t have self rising flour so I made my own with baking powder and soda. I also didn’t have Panko breadcrumbs so I dredged my chicken twice in the egg and flour mixture; turned out to be a good breakfast and will have it again for dinner tonight! Yummy! Super delicious and if you make the honey first, then the waffle mix, the whole thing is pretty easy and comes together quickly. I served it with a Brussels sprouts slaw and we loved it. So good! Was a hit with my family and didn’t take too long to make. Shannon, that’s so nice to hear!